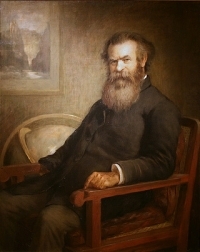 On May 29, 1869, Major John Wesley Powell began the last great exploration of unknown territory in what later became the continental United States. Powell was a civil war veteran with a profound interest in botany, geology, and biology. Major Powell's party embarked on their journey down the Green River from a small island in the town of Green River, Wyoming, near what today is called Expedition Island. Ten men manned four awkward, wooden boats not really suited for the long trip or the white water rapids to follow. Early accidents robbed the group of equipment and provisions. The explorers made their way down the Green past Flaming Gorge, which they named, to the confluence with the Colorado and into the Grand Canyon. Three men who left the party at Grand Canyon were killed by Indians. Powell and five others completed the first exploration on August 30, 1869. In 1871, Powell made another trip down the Green with more suitable equipment and provisions. Powell was appointed Director of the US Geological Survey and worked to preserve western lands. Today, Expedition Island is a National Historic Site, serves as a community park, and contains a pictorial history of river explorations along the Green River. For more information about John Wesley Powell in Green River, contact the City of Green River at (307) 872-6136.